Green oases rising among the fine white sand, 8000 palm trees, a “Blue Flag” award certifying the quality of its sea, first-class tourist reception and entertainment, shops and boutiques, delicious cuisine, a mild weather, entertainment for children and adults, cultural events, sports facilities, a wonderful countryside, 14 kilometers of cycle paths, contemporary artworks and historical traditions. San Benedetto del Tronto is all of this. The city takes pride in its sea-promenade, a 4 kilometers long stretch, lined by palm trees, where hundreds of different plant species thrive in charming theme gardens. Ponds and fountains, relaxation areas, playgrounds and artworks make it a really unique place. 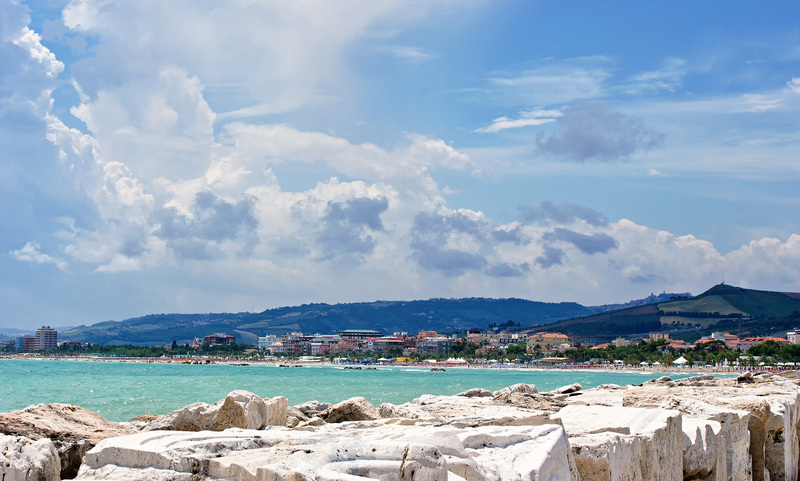 Besides being a beautiful seaside resort, San Benedetto is also an important port town and one of the main fishing ports in Italy. Hundreds of pleasure crafts are moored in its tourist dock, while the south pier has become an open-air modern art museum. One of the most remarkable landmarks of the city risies in the old town district: the “Gualtieri Tower”, called “il Torrione” (the Big Tower) by the local people, a twelfth century building overlooking the city.